Until recently, William Fisk didn’t have a great place to paint. He used to work in a small rented space on Adelaide but had always wanted a separate studio space at home. So when he found a house he loved, with its crumbling garage in the backyard, he pounced. Fisk designed the studio himself and worked with an architect for drawings and permits. The bright white walls and surgical steel countertop show his penchant for order, while the giant, custom-made window and comfy chair make it a place where he can easily spend an entire day—which he does, settling in for hours on end to paint. While the structure is entirely new, he kept the oversized garage door to make shipping his paintings easier. 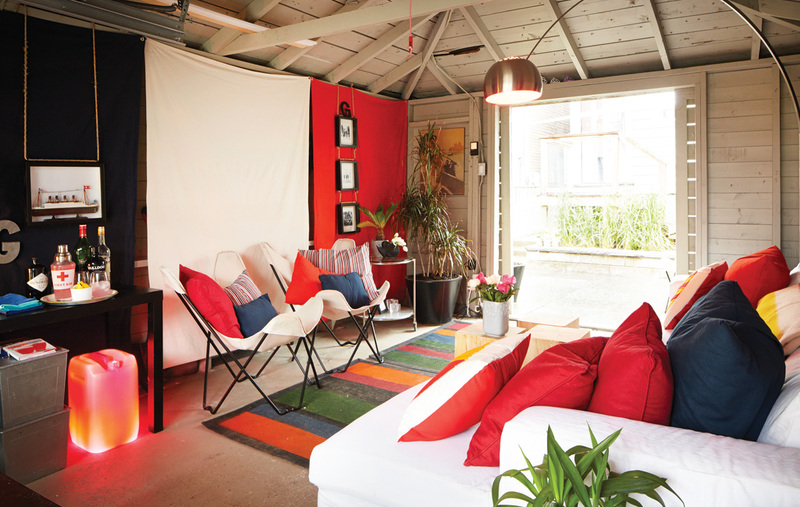 Stewart and Wallace first transformed their unused backyard garage in 2007, after a designer friend suggested the overhaul one night over drinks. 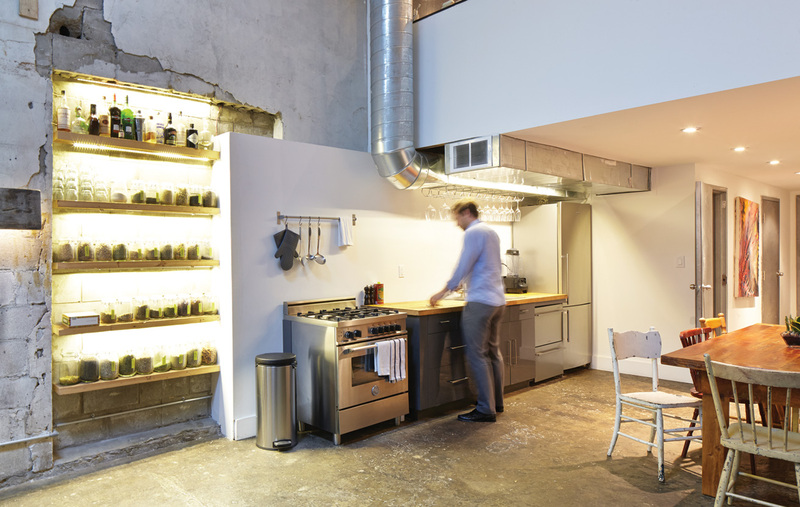 Neither had a car and the reno was a smart way to extend their living space without paying for an all-out addition. They redecorate for fun every couple of years: first, they gave the space a safari motif; then a Miami-Beach-meets-Marrakesh theme, with fuchsia and bright orange accents everywhere; now the space is decidedly collegiate, with varsity colours emblazoned on throw pillows and a set of mounted canoe paddles. It’s a relaxing place for dinner, drinks (Stewart makes a stiff negroni) and, when no one else is around, mid-afternoon naps on the giant, plush sofa. When Robinson first saw this back-alley garage in 2009, it was packed with stacks of floor joists and stray two-by-fours. The owner was looking to rent it out, and Robinson hatched a plan: with a little work, he could turn it into a speakeasy. After two years of running his bar, though, the neighbours complained about the noise and, one night, the cops shut the party down, evicting 200 revelers. So Robinson turned his den of iniquity into, well, a traditional den. Now, the former stage is a platform for yoga and the bar area has become a kitchen and dining room. The space has only one small window, so Robinson punched a series of skylights in the roof that wash the rough, cinder-block walls with light. La Traverse bought her home four years ago because of its great bones—it was designed in 1906 by the legendary architect Eden Smith. Because these are heritage buildings, she couldn’t tear down the old backyard garage to build her dream pool. 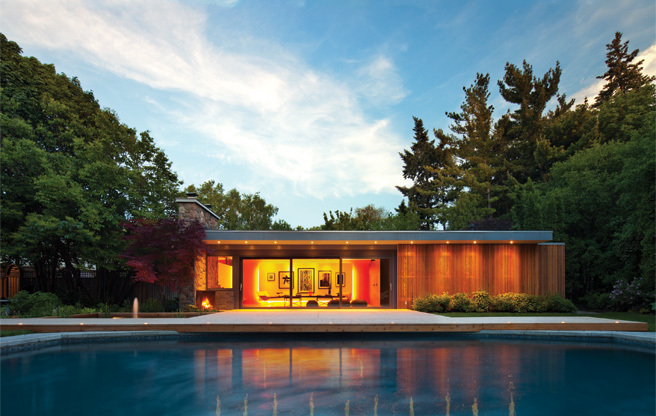 Certain there had to be a solution, she turned to the architect Drew Mandell, who completely re­designed her yard. His most ingenious upgrade was the garage, which he cleverly divided in two. One half he barely touched: shielded from view by a frosted glass screen, it’s used to house a car and the pool’s mechanical equipment. In the other half, he created a tiny, chic cabana by installing sliding glass panels, adding a kitchenette and painting the walls bright white. La Traverse uses it to host cocktail parties or, on a lazy day, kick back with a book. For the rest of this story, please see the August 2013 issue of Toronto Life magazine. 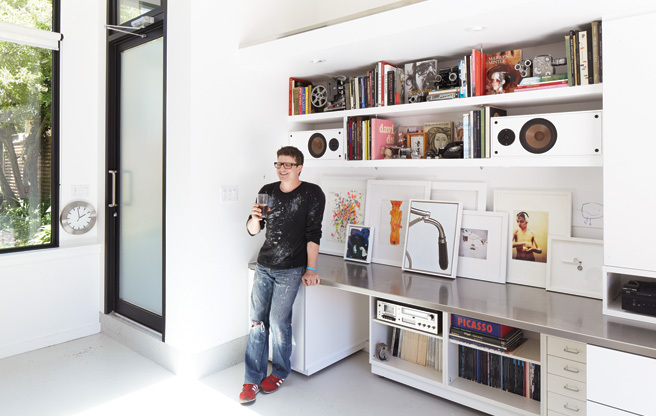 This entry was posted in Design Spy and tagged Architecture, Drew Mandell, Garage Conversion, Great Spaces, Home Renovation, John Tong, Toronto Life, William Fisk by mmhague. Bookmark the permalink.